I am the original owner of a 2008 1125R. Bike has 16K miles on it. All factory fixes up to Buell/Harley split have been done. Bike was stored for 3 years. Full 10K service (fluids, filters, hydraulics, cooling, new battery, etc). Bike now surges between 4-5k RPMs. If I ride above 5K RPM SOMETIMES check engine and/or battery light comes on. Looking at the amperage, it fluctuates under steady speed/steady RPM between 11.8 and 13.9. When it get's below 12, battery light comes on. Is this a bad stator? How does the stator go bad in storage? I also am thinking your battery. Even on a tender or disconnected it will still age and get weaker, and these bikes are sensitive and will have running problems like you describe. I'd double check that your battery is still good with a load test, or just bite the bullet and get a fresh one. 3 years seems to be about what I get out of them on the 1125s before they start having issues. Yep. Apparently religious use of a battery tender does not make much of difference. These bikes are hard on batteries. 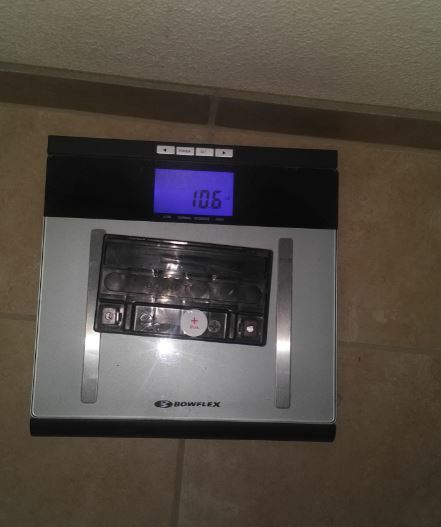 I just lost my battery yesterday. It's about my fifth battery. This last Yuasa AGM battery lasted less than 2 years. I am going with a Lithium Ion battery because it can't be much worse than a lead acid battery, plus it had some advantages in weight, low self discharge, etc. Battery and trickle charger less than $150 and it has a two year warranty. 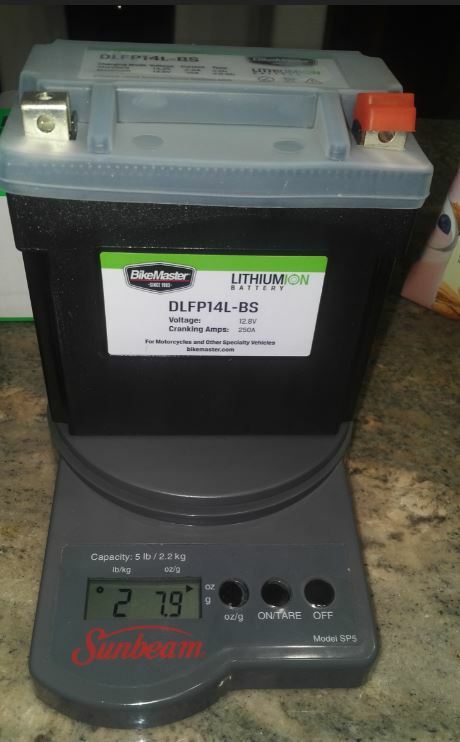 Almost an 8 pound weight savings up top (The Lithium Ion is a wee bit more than 25% the weight of the AGM lead acid.) Gotta love that. And the cranking amps are rated at 250 vs. 200 for the old battery. That doesn't hurt either. I am impressed with the build quality of the Bikemaster battery. Feels like a decent battery for the price ($105 on ebay). Waiting until my trickle charger to come in before final installation because I want to include the charger pigtail when I button up the new battery. The positive terminal is hard to connect and I don't want to do it twice (See below). The Lithium Ion battery requires a slight re-route of positive cable to gain some slack so the cable can connect to the top of the post (with battery laid in position). A little bit of re configuration is necessary because the posts are deeper (again when the battery is laid in position.) Certainly doable tho. I’ve been running the ballistic lithium ion battery for about 5 years now. The weight savings of the lithium ion batteries is great but they don’t like starting below 60 degrees vary well. When they are cold it might take two or three attempts to start the Bike to get the battery warmed up enough to get the engine to turn all the way over. I ran some sort of lithium battery 7-8 years ago on my trackday 1125r. It literally was a bunch of cells wrapped together in a rubberized material with a positive/negative wires. It actually worked surprisingly well for as "crude" as it appeared. I remember having to use velcro to secure the darn thing as it was about the size of maybe 1/2 of a brick. And it definitely did have some cold start issues, but it didn't take much to warm it up to get adequate power to start the bike (2-3 attempts to crank). It lasted about 2 years with no battery tender. It appears both the Li technology and batteries have come a long way since then. A drop in replacement is very nice. 2 year warranty is pretty good too IMHO. Anyhow the Bikemaster endorsed "cold start" technique is no longer than 5 seconds of cranking, followed by 30 seconds of rest--until the bike starts. I'm sure 10-15 seconds of running the headlights would work too if for some reason you don't want to crank multiple times. I wonder if there's a reason they don't want you to run the lights vs. cranking the motor? I've said this before, but I will repeat myself. Li batteries are not suited for motor vehicle use for a host of reasons. They don't like high discharge or charge rates and their performance drops off sharply below 10 C degrees. Their use must be controlled by a sophisticated battery controller usually external to the battery. Further aggravating this situation on a motorcycle is the very crude charging system used on bikes. Li batteries can be used on a race bike in a race track environment, but they must be removed from the bike after use and charged indoors by an intelligent Li battery charger setup exactly for that battery. It is extremely difficult to beat an adequately sized AGM battery on these bikes. I also highly recommend scrapping the factory shunt voltage regulator and replacing it with a series regulator and always, always use a battery tender when the bike is parked. Perhaps my AGM battery woes are because of overcharging. My typical route has one stoplight and the engine is run mostly at higher RPMs. I don't know, but my last 2 AGM batteries had lastly about 3 years in total (only 3,000-4,000 miles per year) and I am religious with a CTEK "intelligent" battery tender/charger. The cold start issue with Li battery is a non-factor for me as I don't ride when in temps where the battery will be seriously affected and even then a few attempts at starting will wake the battery up. I am more worried about high garage temperature storage conditions over the summer as this appears to be detrimental to Li battery life. Bikemaster sells a $30 tender specifically for Li batteries, so it doesn't seem like maintenance is too much of an issue. Apparently, the main difference between the Li and Lead Acid tenders, is the LA tenders can have a pulse charging mode and they may not bring the Li battery up to full charge. I know every charging mode on my CTEK begins with a pulse charging phase. From their literature regarding the Li charger: "Note: BikeMaster recommends that you only use a Lithium Ion specific charger/maintainer for your Lithium Ion battery. Most regular charger/tenders have a different charge profile that may not get the Lithium batteries up to a full charge, thereby shortening their life cycle. Also, some chargers will have a “pulse” or “desulfation” mode that will kill a Lithium battery." And I believe the Bikemaster has some sort of on-board intelligence to avoid over-charging from the bike. From their literature regarding the Li battery: "Built-in charge and equalizing protection board, preventing battery from over-charging." Perhaps I am interpreting the above statement incorrectly, but it would seem reasonable given the crude charging systems on most bikes, as you correctly stated. Hey Fresno, can you post particulars on that battery ? I have to replace one on my '25, and like yours they did not last long. Well, I have been on a single ride with the Li battery. Started like a champ at home, then after a fuel stop. Worked fine, but it should of course. I the voltage was 13.2 out of the box and it's been hovering around 13.3 for the most part. I do have the Bikemaster Li tender on it and it activated for the first time after my Sunday ride. Only for a very brief period. Can't say much else other than I love the weight savings high up on the bike. If I didn't think it's purely a mental thing, I would say it's actually noticeable.